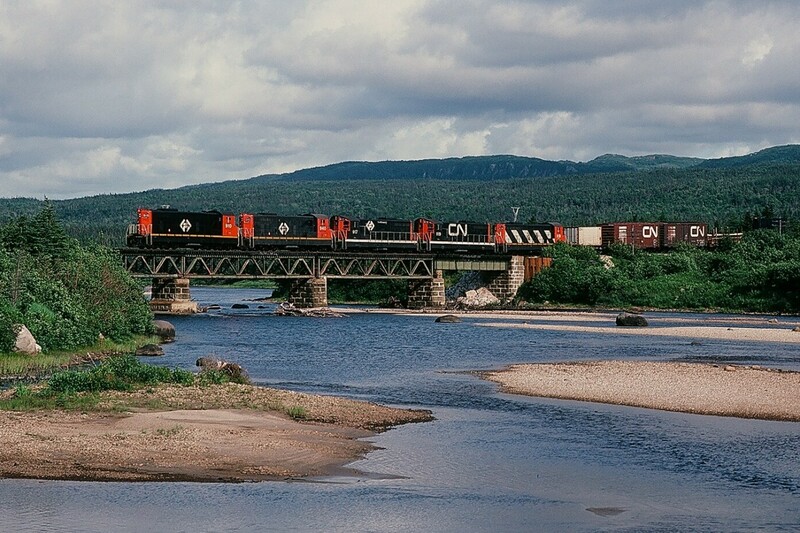 Railpictures.ca - sdfourty Photo: A railway that owned 51 diesel locomotives and where the daily freight trains have a 548 rail route mile run…(and is now gone…) …today, August 2, 1982, the daily train is five hours into the 24 hour run to St. John’s: Terra Transport #204 is at the Black Duck River bridge with five NF210′s: TT#910 – TT#940 – TT#917 – TT#919 (CN noodle) – TT#918 (CN zebra) with eighty plus cars: a dimunitive railway? Hardly. (what’s interesting: some distance perspective, compare the Terra Transport Port-aux-Basque to St.John’s: 548 rail route miles to the Windsor Ontario to Montreal Quebec: 558 CN rail route miles.) More Terra Transport: Terra Transport #232 near Clarke’s Beach Terra Transport #206 near Lockston Terra Transport power for #204, Port-aux-Basques TT #927, Port-aux-Basques TT #929, Corner Brook sdfourty. | Railpictures.ca – Canadian Railway Photography – photographie ferroviaire Canadienne. ...today, August 2, 1982, the daily train is five hours into the 24 hour run to St. John's: Terra Transport #204 is at the Black Duck River bridge with five NF210's: TT#910 - TT#940 - TT#917 - TT#919 (CN noodle) - TT#918 (CN zebra) with eighty plus cars: a dimunitive railway? Hardly. Nice shot, you get the 4 modern era CN paint schemes CN used in Newfoundland. 1960′s era large noodle, post 1973 zebra stripes, early TerraTransport and revised TerraTransport. Stunning! wish I could turn back time. A beautiful image. I will always regret never making it to the Rock. That scene looks as scenic as some places out west!